Readers sometimes tell me they’re unable to comment on my blog. I’ve spoken to my webmaster about this and he assures me that Disqus — the software my website uses — is the easiest system available. Still, if my readers are not happy, I’m not happy. 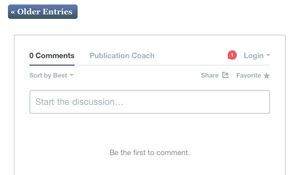 So today I’m offering a detailed tutorial on how to comment on my blog. This will stay on my website in perpetuity (well, at least as long as I’m living, breathing and writing). Step 1: Open a blog entry by clicking on its headline. 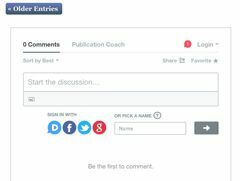 (If you’re simply on the master blog page, https://www.publicationcoach.com/blog/, or my home page, https://www.publicationcoach.com, you won’t be able to comment. Make sure you’re inside the actual blog entry by clicking on the headline.) Then, scroll to the very end of the entry (below the “More from my site” photos) until you see the comments section, just as I’ve shown in the picture above. 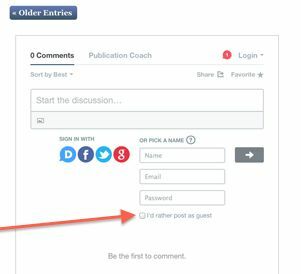 Step 3: As soon as you click on the Name box, the page will expand and you’ll see a new line, reading “I’d rather post as a guest.” Simply click on this box (I’ve marked it with a red arrow, below) and a tick mark will appear. As soon as you’ve done this, the password box will disappear. Step 4: Finally, enter your name and email. Note that you can use a fake name if you like and the email will NOT be public. I’m the only person who will have access to it. You have not created an account. You are simply posting as a guest. I treasure my interactions with readers and I work hard to respond to every comment you make. Please, if you have any difficulty with commenting or with these directions, email me and I’ll do everything I can to help.